Binagoongan is a Filipino dish wherein protein is cooked with shrimp paste. The usual protein used for this dish is pork. 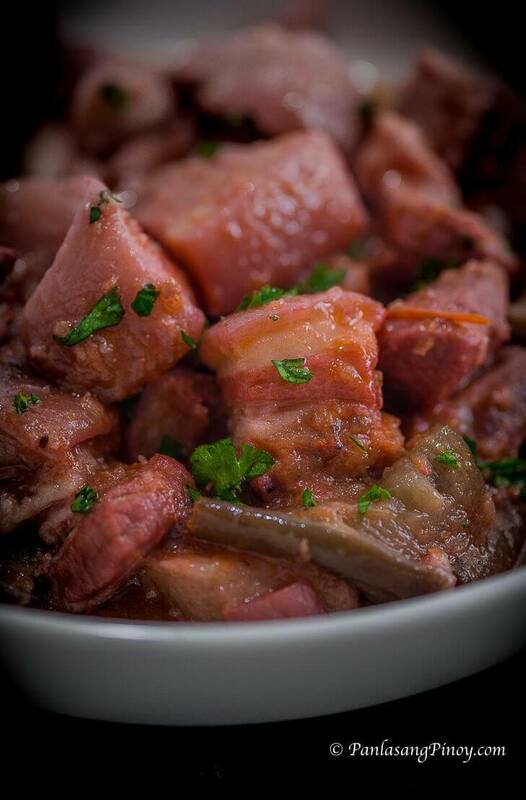 This binagoongan recipe makes use of pork belly. I also added eggplant to make it more interesting. This is a basic recipe for binagoongan, except for the addition of the eggplant. You can omit the eggplant if desired. Some people like their dish spicy. Feel free to add Thai chili pepper or siling labuyo to achieve your intended spice level. You can also use store-bought spicy shrimp paste. This dish can also be kept longer as long as it is handled properly. I usually keep this sealed tight in a jar and keep it inside the refrigerator for up to 2 weeks. I think that the taste gets better overtime after several re-heating. If you want it to last longer, I suggest to omit the eggplant and tomato. These ingredients spoil quickly. Cooking binagoongan is simple. Like most Filipino dishes, the first step is sautéing the aromatics. Start by sautéing garlic and onion, and then add the tomato afterwards. Make sure to saute until the onion gets soft. This makes it sweeter. It helps improves the overall taste of the dish. Next is to add the pork belly and cook until it turns light brown. This is the ideal cut of pork for this dish. However, pork shoulder and pork chops can also be used. In some occasions, I find that using chopped pork ribs also work well. Shrimp paste or bagoong refers to fermented tiny shrimp. The type of shrimp used to make bagoong alamang are called acetes. These are small shrimp native to Asia. Add the shrimp paste once the pork browns and then pour vinegar. The vinegar helps balance the saltiness of the bagoong. The pork belly still needs to be tenderized by boiling. This is the reason why I am adding pork broth. It needs to be cooked between low to medium heat for at least 40 minutes or until tender. Make sure to add more broth or water if the liquid starts to dry out quickly. Sliced Chinese eggplant or talong is added once the pork is tender. This needs to cook for at least 3 minutes. Season your binagoongan with sugar and ground black pepper. We will not be adding salt in this dish because the shrimp paste is already salty to begin with. Pork Binagoongan is best eaten for lunch. Serve it with warm white rice. Try this Pork Binagoongan with Talong Recipe. Let me know what you think. Pork Belly cooked in tomato and shrimp paste with eggplant. This dish is a winner! Saute onion, garlic, and tomato. Once the onion becomes soft, add the pork belly. Cook until the belly turns light brown. Add shrimp paste (bagoong alamang). Stir. Cook for 5 minutes. Pour vinegar. Let the mixture boil. Stir and cook for 2 minutes. Pour the pork stock into the pot. Cover and let boil. Adjust the heat to medium and continue to cook for 40 minutes or until the pork gets tender. Note: add water or pork stock as needed. Add eggplant. Stir. Cover the pot and cook for 3 minutes. Season with sugar and ground black pepper.